Its phones and the new tablet weren’t everything Google had prepared for its big hardware event today. Three more previously leaked devices made their official debut. Meet the Google Home Hub, the new Chromecast, and the Pixel Stand. The Home Hub is a $149 (or £139) smart display that is on pre-order now. It will be available on October 22 in the US, UK, and Australia. If you buy one you will get six months of YouTube Premium for free. It is basically a Google Home smart speaker with a display attached to it. The touchscreen lets you interact more with the Google Assistant, and of course it allows it to show you results instead of simply telling you about them with its voice. On the Home Hub you can use other Google services too, such as Photos, Maps, Calendar, and, naturally, YouTube. And when someone rings your Nest Hello doorbell, the Home Hub will automatically show you who’s at the door. For music Spotify, Pandora, and iHeartRadio are supported among others. Live Albums automatically update to always show you the latest pics of your favorite people and pets. The Home Hub can tell who’s talking to it and will personalize things accordingly. Unlike other smart displays on the market, the Home Hub doesn’t come with a camera. This was an intentional decision on the company’s part, to make you comfortable with the thought of placing one of these in your bedroom, for example. The Home Hub has an ambient light sensor that works alongside AI to enable a feature called Ambient EQ. This will adapt the brightness on the screen to the conditions around it. And when you go to sleep the 7-inch screen will turn off entirely. The fabric-covered base comes in Chalk, Aqua, Sand, and Charcoal, the same colors found on other Google Home products. 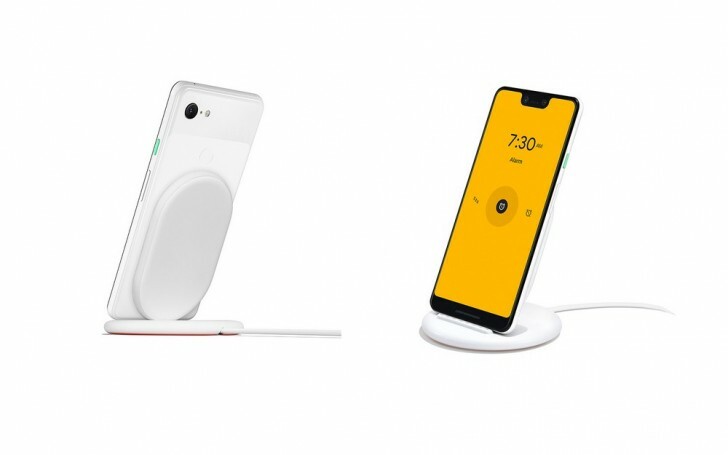 Now that Google’s phones support wireless charging again, the company is also launching a new accessory – the Pixel Stand. It’s a stand for your Pixel, and it charges it wirelessly. However, it also has a neat trick up its sleeve. When you drop your Pixel into it the phone will essentially become sort of like a smaller version of the Home Hub. For example, if you have a Nest Hello doorbell and someone’s at your door, you’ll immediately see who on the Pixel’s display when it’s connected to the stand. The Pixel Stand turns your phone into a photo frame when idle, one that automatically curates pictures it thinks you will like. 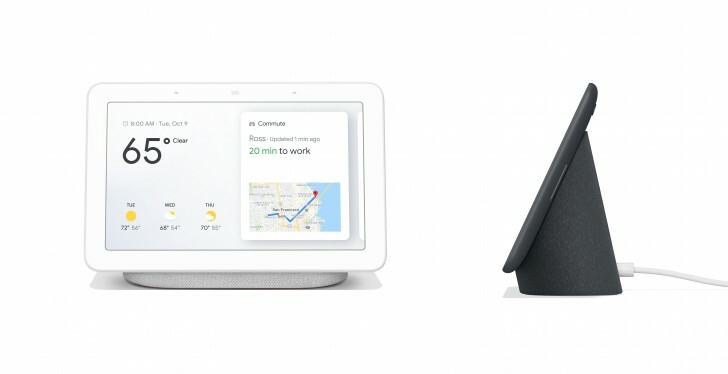 Before you wake up, the Pixel in the stand will mimic the sunrise with its screen for 15 minutes, brightening your room so you can get ready for your day. Then, in the morning, you’ll get your personalized briefing from the Google Assistant just as you would on a Google Home device. At night, when you put the handset in the stand Do Not Disturb mode is automatically turned on. The Stand enables an enhanced music experience too, with your favorite artists’ album covers on display while listening. The accessory costs $79 / €79 / £69, and is available for pre-order today. It can do 10W wireless charging, and will charge your phone in portrait or landscape. It’s Qi compatible so you can drop any other device that supports the standard onto it and it will charge. Obviously the aforementioned software features are exclusive to the Pixel 3 and Pixel 3 XL. Google has also refreshed its non-4K Chromecast streaming dongle with an entirely new look and its iconic G Logo that adorns every other hardware product it’s making. The new Chromecast is available now for $35 (the same price as its predecessor), and you can have one in Charcoal or Chalk color versions.